Defined SoTL and explored examples of its practice through video clips and web links. Considered problems or questions of teaching practice from my discipline area that I would like to research. Built a scholarship plan for one of my courses. Considered the attributes or indicators of student learning that would address my research question. Examined examples of previous scholarship in the identified area of practice. Considered who among my peers could review the study that I will undertake. Considered how I might disseminate the work to others. Shared my research plan through a blog post. 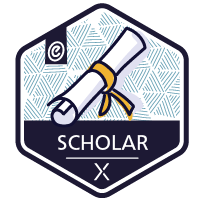 Apply for your Scholar Badge!